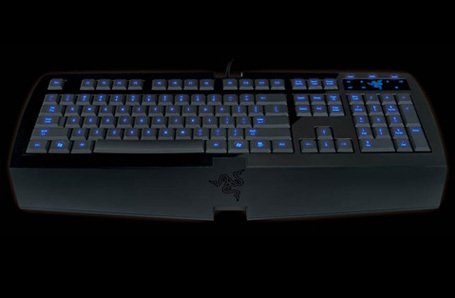 With an awesome host of features, the Razer Lycosa Keyboard is on an unstoppable mission to destroy and dominate. Execute complex combat maneuvers with swift dexterity. Launch your assaults timed to perfection. Annihilate your enemies and reign supreme on the battlefield. You now have the tactical advantage on every terrain, and your enemies’ fates are in your hands. With its non-slip rubber finish, the Razer Lycosa offers optimum tactile comfort and makes slipping up in the heat of action a thing of the past. Make darkness your ally. While your enemies fiddle in the shadows, command precision and take hold of their fate with backlight illumination on the Razer Lycosa. With the right keys lit up, you can always be sure of your next move. Be one step ahead of the competition with fully-programmable keys with macro capability that enable instantaneous command executions. With the Razer Lycosa Gaming Keyboard, you now have the tactical advantage on every terrain, and your enemies’ fates are in your hands.